Tokyo, Japan – May 26, 2016 – LINE Corporation has announced the release of “egg,” a free selfie app for iOS and Android devices that allows users to customize their photos and videos. egg is a selfie app that gives users a greater degree of freedom to fulfill their creative purpose by providing features such as 3D Masks which perfectly fit on faces to transform subjects into extraordinary characters much like prosthetic makeup, and animated filters which are triggered by subjects through an eye blink or other actions that the app accurately detects. The rapid growth of social networks and the selfie trend in recent years has led to an explosion of easy-to-use camera apps with customization features such as filters and special effects that are being used to take selfies for users’ Instagram and Facebook pages. However, unlike other selfie apps, egg not only lets users take selfies, but also play with their selfies in real time. The app offers 3D Masks in more than 50 categories (such as "Cute animals","Beauty","Funny"and"Horror"), and even a mask of the latest LINE character, Choco. Combined with various action-triggered filters such as making hearts appear by blinking, or blowing fire by opening one’s mouth, users can enjoy endless customization possibilities. Additionally, users can create their own original masks using photos saved on their smartphones, or even swap faces in real-time with their friends on screen. 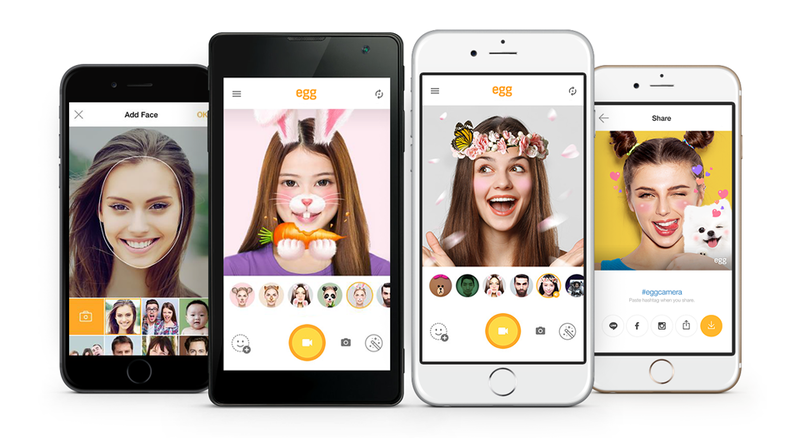 Besides providing the traditional features of a selfie app —uploading selfie photos and videos to social media— egg proposes a new style of real-time communication with family, friends, and partners through selfies. In future updates, egg is planning to introduce3D Masks of popular characters, new animated filters, and other entertaining features to bring customers even closer together. Also added to the collection is a filter featuring Batman from the latest movie “Batman v Superman: Dawn of Justice,” which was opened in theaters worldwide between March and April of 2016. Additional character-based filters such as that of Wonder Woman are scheduled to be introduced in future updates. 50 categories of 3D Masks—ranging from LINE Characters to Cute Animals, Beauty, Funny, and Horror—can be combined with animated filters that are triggered by precisely detecting a subject’s facial movements, allowing users to unleash their imagination and create a variety of customized selfies. Users can create their own original masks using photos that are saved on their smartphone. Users can instantly create a funny video by swapping faces with their friends on screen in real-time. An in-app feature allows users to upload photos and videos directly from the app to their social networks.